A broadly rounded shrub that has large, round clusters of blooms in mid-summer. The blooms are bright blue when the shrub is planted in acid soil. 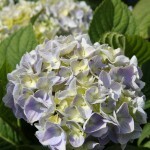 As with many hydrangeas, the soil pH can change the flower color. It needs moist soil and prefers partial sun.